SOMANATHAPUR TEMPLE SOMANATHAPUR TEMPLE - Shiva Maha Purana, Vishnu Purana, garuda purana, bhavishya purana, skanda purana. Somanathapur temple, not to be confused with Somnath temple near Veraval in Sourashtra, which was pillaged by Mohammad of Ghazni, is a temple of great architectural and sculptural beauty. It is located in a small village, about 40 kms. east of Mysore City in Karnataka. Situated on the right bank of the river Cauvery, the site was selected by Somanatha Danayaka, one of the Governors under the Hoysala Empire in about 1258 A.D. He built the temple dedicated to Keshava (Vishnu) in the centre of the village and constructed a protective wall around the village, remnants of which are seen even today. The Governor made a grant, with the permission of the Hoysala Emperor, Narasimha III, for the maintenance of the temple. The temple of Keshava faced very bad days when the notorious Malik Kafur, the Slave General, under orders from Alauddin Khilji of Delhi, invaded the Deccan and the South in 1311 A.D. He carried away gold, silver and precious stones and disfigured the Somanathapur temple. Thereafter, the Somanathapur temple passed into oblivion and a dense forest grew around it. According to the inscriptions, in 1497 A.D., under orders from King Immadi Narasimha Saluva, one Narasimha Wadeyar of Ummattur restored the village. The Vijayanagar kings, the traditional heirs of the Hoysala empire, did some work in restoring this old Hoysala temple at Somanathapur. With the decline of the Vijayanagar Empire, the temple again fell into disreapair. The Mysore Wadeyars carried out some repairs to the temple in about the year 1895 A.D. Later, the regular maintenance of the temple passed on to the department of Archeological Survey of India. 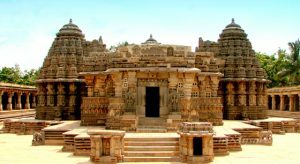 The temple of Keshava is a ‘Trikutachala’ in style wherein, it is a combination of three shrines built in a crossshaped plan. All the towers (vimana) are still in a good state of preservation. Each shrine is star-shaped, with sixteen sides, the vertical tapering ribs composed of elaborately carved miniature shrines. The three towers of the temple are beautifully proportioned and sculptured. It is the design of the three towers, their proportions and equipoise that have made the Somanathapur temple most famous for its beauty. Like many other Hoysala temples, the Somanathapur temple is built on a stone platform about a metre high and has only one flight of steps from the east, on either side of which are two towered miniature shrines which contained originally the deities guarding the entrance (Dwarapalas). The platform, which runs parallel to the temple structure, is also shaped like a star around the three shrines, on the alternate corners of which there were originally beautifully carved stone elephants, with medium-sized images of Nagas in between. Only eleven of the fifteen elephants are now in their position ; two are placed to guard the main gate of the temple, one is placed in the north-east corner of the platform. The outer surface of the wall of the temple has friezes elaborately carved, with a row of sculptured elephants at the bottom, all caparisoned generally with one or two riders and attendants and marching from right to left as a rule. Some of the elephants are shown catching hold of riders on other elephants or even their own riders, trampling on some persons, while other elephants are shown as playing with bells, ropes and tails of other elephants. The second row shows a long line of horsemen, wearing a sort of shorts and high boots and charging from right to left on their horses with weapons like the sword, spear and shield. Some footmen are shown holding umbrellas over the heads of dignitaries like kings, princes and princesses. Occasionally a sculptured camel with drums on its back with riders vigorously playing on them, breaks the monotony. Then follows a row of scroll frieze with sculptured flowers, fruits and occasionally a pea ock and a lion. The frieze above the scroll frieze consists of scenes from the epics Ramayana, Bhagavata and Mahabharata. There are episodes with a court scene with Dasaratha and his three queens and the sages giving advice; Dasaratha performing the sacrifice to beget sons; the birth of Rama and his brothers; the sages giving lessons to them ; sage Viswamitra taking away Rama and Lakshmana to the hermitage; Rama breaking Shiva’s bow and marrying Sita, and so on. The more important sculptured scenes of the Bhagavata frieze depicting Vishnu as Seshashayi in the milky ocean with Brahma and the Devas praying; the marriage procession of Vasudeva; Vasudeva crosses the river Yamuna with Krishna protected by Adishesha; Krishna lifting the Govardhana hill and is worshipped by Indra; and the death of Kamsa. Similarly, the Mahabharata episodes are elaborately sculptured showing the journey of the Pandavas to the forest upto the final Kurukshetra war. Above this mythological friezes is a continuous ribbon of sculptured animals with the body of the rhinoceros, head of a crocodile and legs of the elephant. This is followed by a panel of swans, gods and goddesses. The outer wall of the temple has many beautifully carved sculptures consisting of a chief deity with consorts. The flat bases of these sculptures have engraved on them the name of the sculptors like Mallitamma, Chaudaiah, Baliah and Elemashiah. Over each of the stone idol is a beautifully carved arch. All these carvings are on a kind of grey steatite stone, which is very soft when quarried and allows very intricate carvings without breaking, but hardens later when exposed to the sun, air and rain for some months. The Somanathapur temple is also known for its ceilings and pillared Navaranga Hall. There are many squares in the main hall and each of them has a beautifully carved ceiling shaped like a dome simulating wooden carvings. The hall has three doorways inside which lead to three cells and the niches against the western wall. The ‘sanctum sanctorum’ of the south cell contains an idol of Vishnu depicted as Venugopala, fully ornamented with jewels. This idol is in the ‘tribhangi’ pose mounted on a Garuda pedestal. In the western cell the original Keshava idol is replaced by a recently executed idol. The north cell contains the beautiful undamaged idol of Janardhana wearing a crown and the other attributes like the padma, chakra, shankha and gadha in his hands. Somanathapur can be easily reached from Mysore as it is connected by an excellent road. Many tourist buses run from Bangalore also. There is a small rest house near the temple but it ip preferable to stay at Mysore where excellent lodging facilities are available.